The results are in for the Decorate Jackie for Halloween Contest. Click our little friend, below, to see all the winners. Congratulations to everyone who entered - this year's designs were even more amazing than last year's! You're making it very hard for the JC Group to pick a winner! 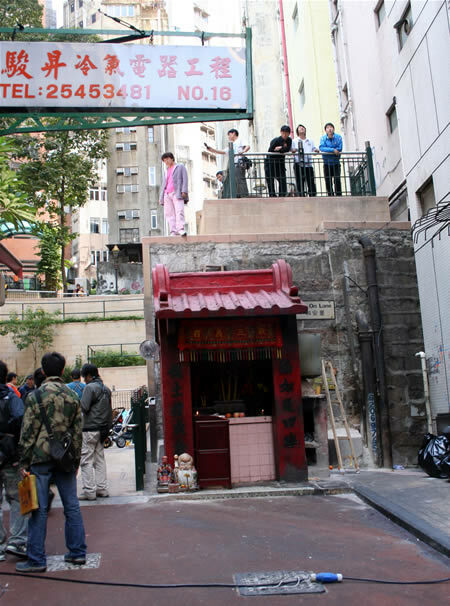 This is where Jackie filmed a scene with Yuen Biao. 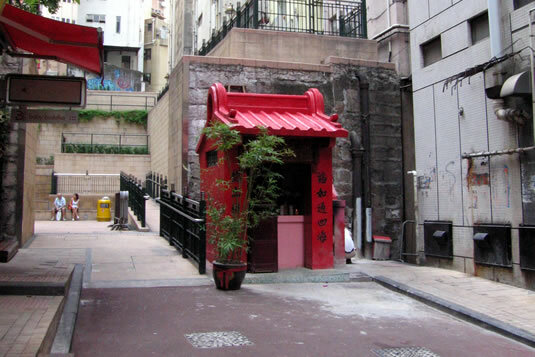 Jackie jumped down onto the little red building. 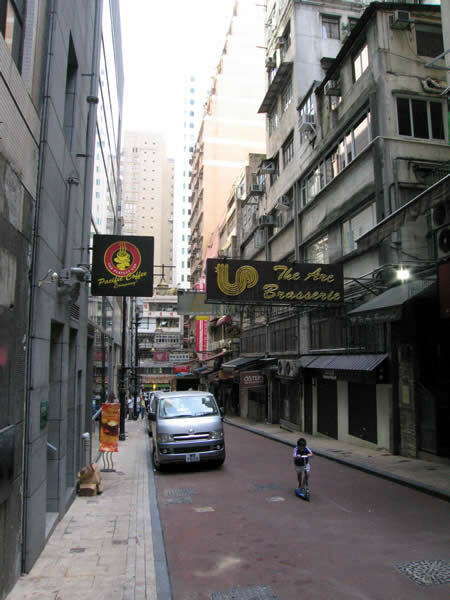 In the movie (not in this photo), you can see Jackie's car parked on this street during one of the scenes shot here. 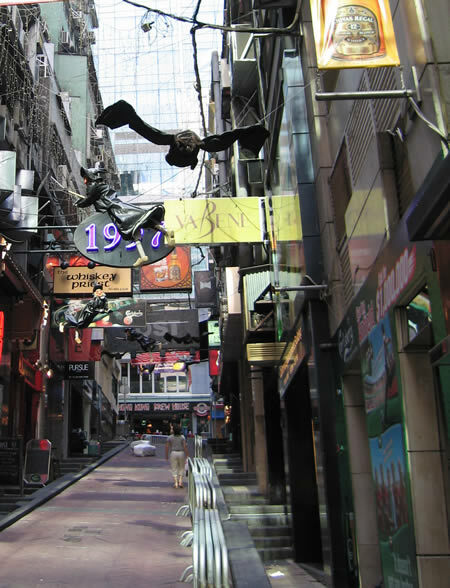 Here's another place where Rob-B-Hood filmed. 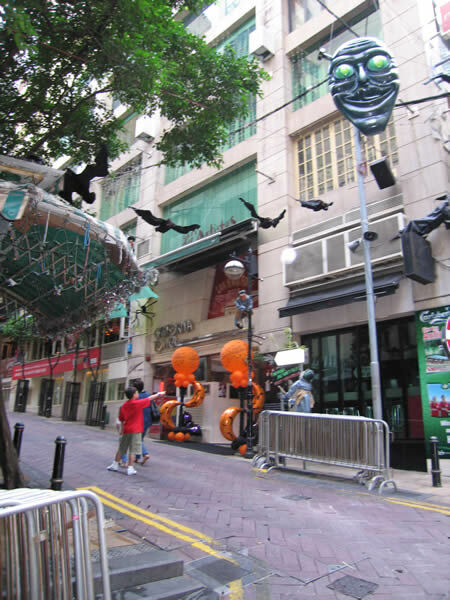 The cut-off date for submissions to the Halloween Contest was October 27th and that was just in time for Jackie to make an appearance in Hong Kong to help with the judging. 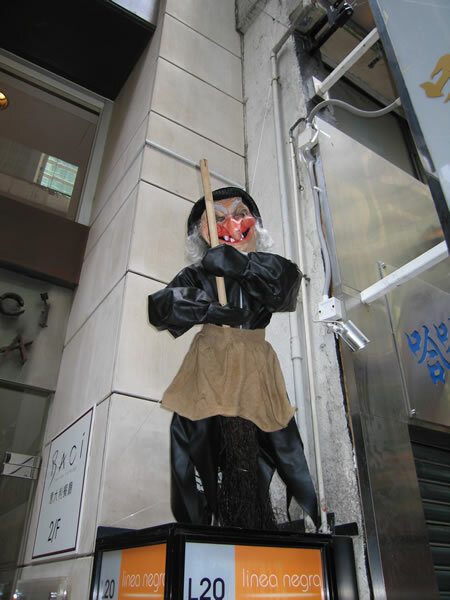 The contest has been judged and the results will be announced on October 31st - Halloween! 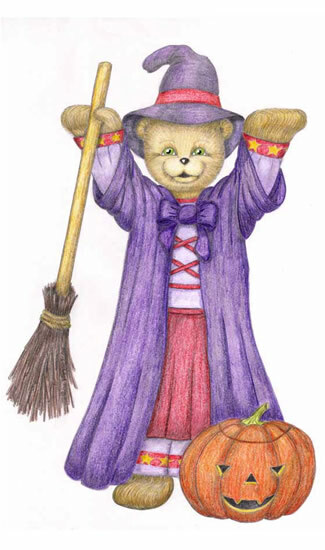 Here are three beautiful Buddy Bears for Halloween created by the wonderfully talented Petra from Germany. You can also see them at the Buddy Bears pages, along with several new Buddy Bears from other fans. We have also received many new Decorate Jackie for Halloween designs. Click here to view the latest. October 27th is the last day to submit a design, so hurry up. There are great prizes. 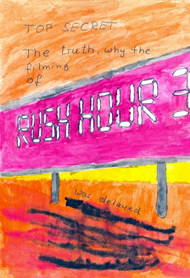 Check out the latest Movie That Wasn't sent in from Marcia in Australia! Click here to see all the funny movies that Jackie never was in! Benjamin from Canada (well, we think he's from Canada) saw the latest photos of Jackie's puppies and wanted to share some pictures of his own Golden Retriever, Toby. 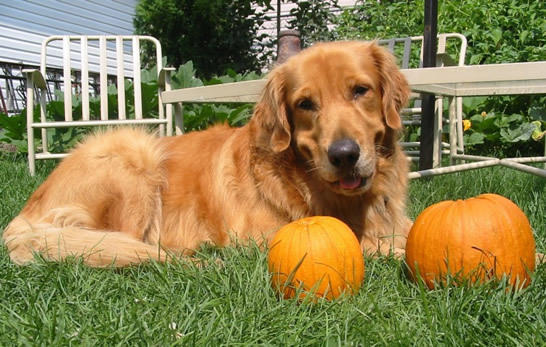 We usually only feature pets that are named after Jackie, but since Toby is the same color as the pumpkins and Halloween is nearly here...well, we thought we'd make an exception. So here's Toby! 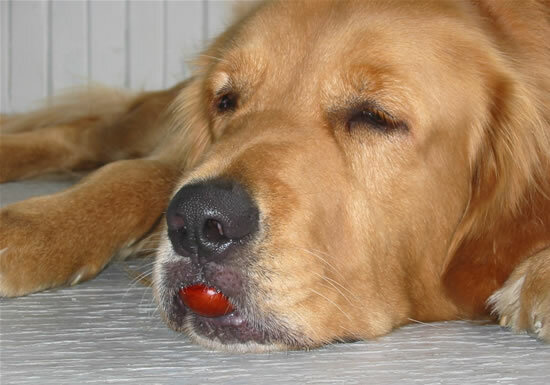 Toby is sleeping with a chestnut in his mouth! Thank you to everyone who has participated in the project and remember - we're only one-eighth of the way there. If you've already contributed but would like to stay involved, why not introduce the project to your teacher or your friends? These donations have come in just recently. Most have been mailed in, but some have been brought to the office. We have been unable to keep up with scanning all the donations, but we will continue to take photos so that you can see that we are receiving them. There are many stories to tell regarding the donations. A very large donation came from an American woman who walked in the front door of our office and handed us a wad of cash. 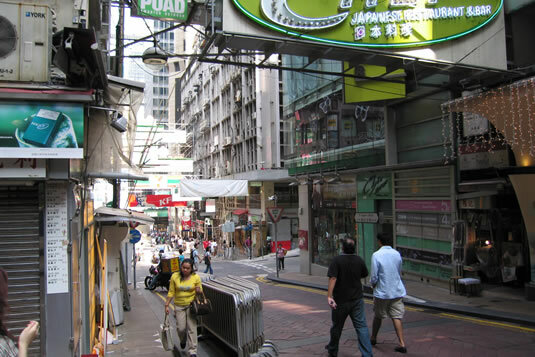 Another donation came from an English woman who had promised to mail us the leftover dollars she had from her trip to Hong Kong. She kept her promise. Between these two people, we received hundreds of dollars ($US). Sometimes we get envelopes containing a dollar and nothing else. Sometimes there are letters that begin, "I don't have much myself, but I am sending what little I can..."
So many stories! We would love to share all of them with you, but that would be impossible. 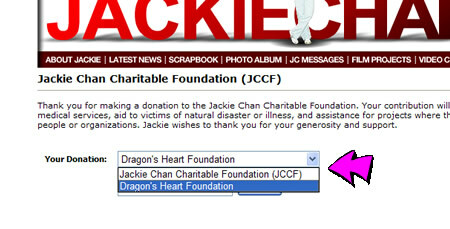 Just know that your money is going to a good cause and we will continue to work hard to make the dream of a Dragon's Heart School built by Jackie's fans come true! 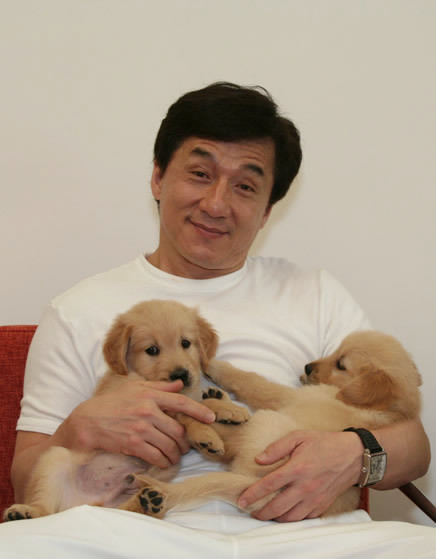 As you know, Jackie is in Paris filming Rush Hour 3, so he couldn't be here for a photo session with the puppies. Jackie wants us to show you photos of Jones and JJ every month or so until they're fully grown so you can see how fast it is happening! Yesterday the webmaster visited the pups for a photo session and after being slobbered on, knocked over, and puppy-kissed a thousand times, she got a few useable photos. You should also know that she smelled like a Golden Retriever for the remainder of the day. You can see all the photos at our Photo Albums section. Here are a few to remind you how fast the pups grow! Here is a translation of the beautiful theme song from Rob-B-Hood, which is sung by Jackie and has some sound effects from Baby Matthew. Jackie co-wrote the lyrics to this song. This is not an official translation. This is just Fibe and Kath trying their best. Hope you enjoy! Because I worry that you will become ill as you sleep. I forget my own fatigue. and you will have no regrets. Can you understand what we’ve done for you? Fibe and Kath working hard to translate Rob-B-Hood theme song! 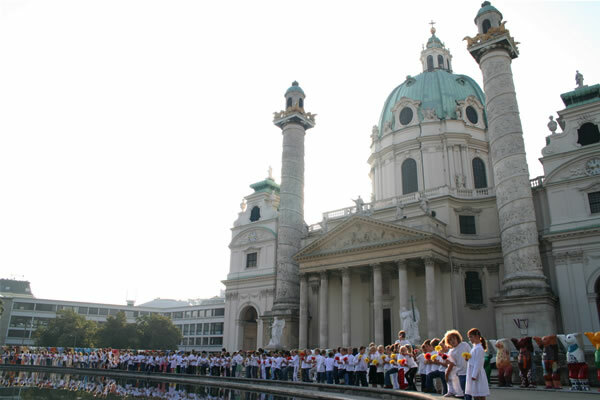 Thank you to United Buddy Bear co-creator Klaus Herlitz for sending us photos of the Buddy Bears celebrating the United Nations International Day of Peace in Vienna on September 20th. The Buddy Bears were on display at the Karlskirche from September 1st to October 7th. Nearly 300 schoolchildren threw flowers into the basin that lies in the middle of the Circle of Buddy Bears on this special day. Jackie's Build a School for a Dollar fund (check out the banner above) is growing steadily as donations come in from all over the world. Most people send a dollar, but some people send more. Many of Jackie's fans are planning fund raising efforts and those will be featured here at the Kids Corner when they get going. There are several parents who are involving their kids' schools, sports enthusiasts who are putting together activities to raise money, and families who are getting together to make donation drawings. There are so many stories from fans about how they are involving others! Jackie is very pleased and as soon as he's back in Hong Kong we will try very hard to take more photos of him with the donations. Right now it is nearly impossible to post all the individual drawings, but please don't let that keep you from sending yours in. Many people are contributing on a regular basis - sending money every few weeks or each month. 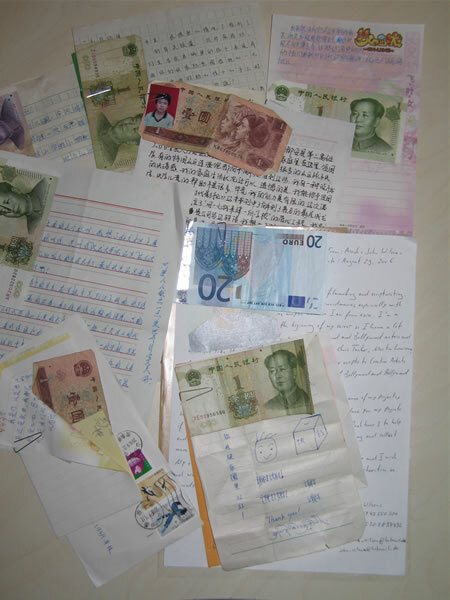 We have gotten dozens of letters with money from China, and dozens of envelopes with money and no letter! Thank you to everyone and keep up the good work. Please check our website for updates on the Build a School project! 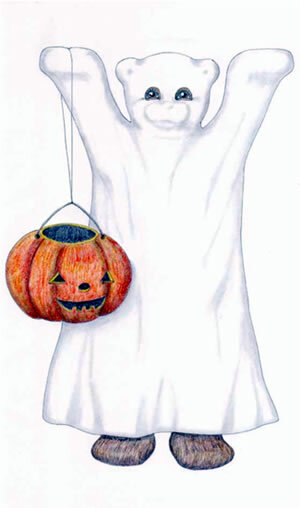 Click on me to see the newest Halloween designs! 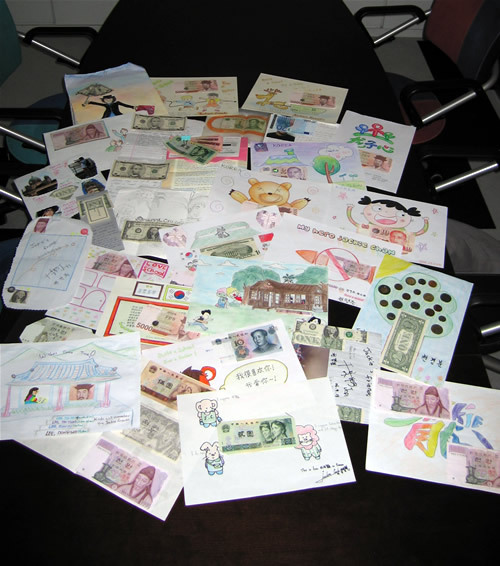 A group of Jackie's fans in Korea recently sent in a collection of donation drawings for the Build a School project. Although Jackie couldn't see the drawings in person, we sent him a photo by email so that he could have a look at all the creative designs from his devoted fans in Korea. Now all of these designs are posted at our Build a School pages. CLICK HERE TO SEE THE KOREAN CLUB'S WONDERFUL DONATIONS. Thank you to everyone who has sent in a donation or a donation with a drawing. We are so overwhelmed by the number of people who are getting involved! If you do not see your drawing posted right away, that doesn't mean we haven't received it. It just means we haven't had a chance to post it. Soon we may start posting photos of groups of donations because we are getting so many that it's almost impossible to keep up with scanning them all! Jackie is in Paris and is given updates on the project every few days. He wants to tell you that he appreciates all your help and also wants to encourage you not to stop! We have come a long way, but have a long way to go. Many people have written in saying that they are trying to involve their schools or clubs in this project. Thank you to everyone who is trying hard to spread the word and get others involved. Please have a look through the drawings to see all the new ones and check the Photos of Jackie at the Build a School pages because they are occasionally updated. More designs have been posted at the Halloween contest pages!! So many people are sending in donations that we are having a hard time keeping up with all of them! We have posted some of the drawings that are counted into the updated total (above). Thank you to everyone who has sent money for this good cause. We have received money from all over the world! Sometimes people just put money in an envelope and don't even include a note. But however you want to donate, it's fine with us. We will continue to update Jackie while he is filming in Paris. Thank you so much to everyone! CLICK HERE TO SEE THE NEW DONATION DRAWINGS. MORE COMING SOON! 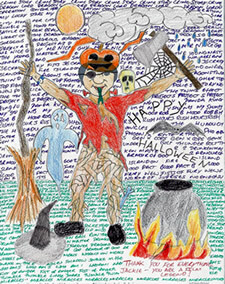 CLICK THE GHOST TO SEE THE LATEST SUPER-CREATIVE "DECORATE JACKIE FOR HALLOWEEN" DESIGNS! Well, Jackie is going to be the best dressed guy this Halloween because his fans have endless creative ideas for costumes! 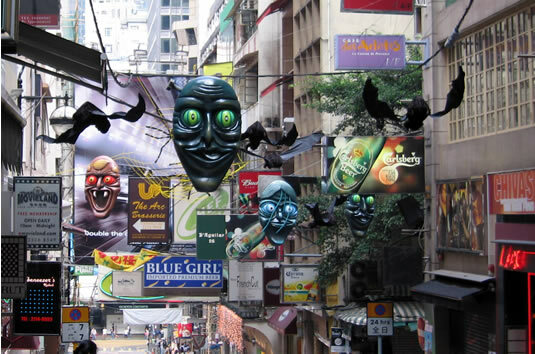 Check out the latest entries in our contest here! 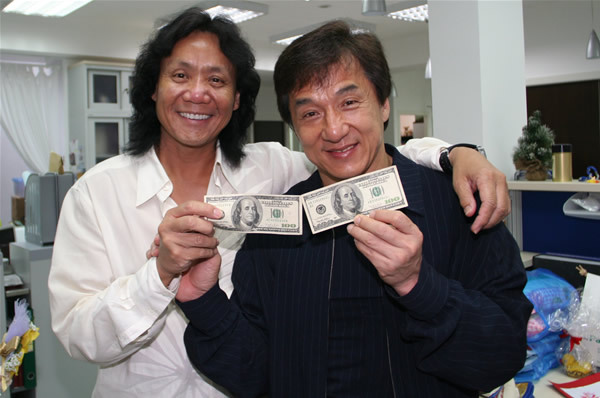 Right now Jackie is away filming Rush Hour 3, so he can't pose for photos with all of the donations we have received. However, we are taking photos of the donations and sending them to him in Paris so he can keep up with what is going on. And you should see what is going on here! We are getting dozens of donation drawings every day and the money is starting to add up. We are getting money from all over the world! Jackie is so happy with what is going on and he wants to thank each of you for your generosity. We have gotten many letters - some of them are very touching. People have written in to say that they are themselves poor, but that they would still like to make a small donation. These small donations add up when they are combined with other donations. Remember that no amount is too small. Jackie appreciates all your help and wants to encourage you to continue helping in any way you can. If you have sent a donation but feel that you want to send another, please do! We will keep track of all the money and make sure that every cent is used for the school. 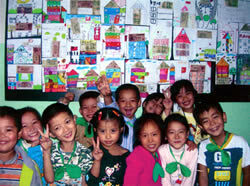 Build a School For a Dollar Fund Keeps Growing! If you place a small snowball at the top of a snow covered mountain, it will grow bigger and bigger as it rolls downhill. The same could be said for Jackie's Build a School project. In only about two months, the total amount for the fund is up to US$5,576 and Jackie is thrilled. He talks about the program every chance he gets in an effort to keep interest alive. 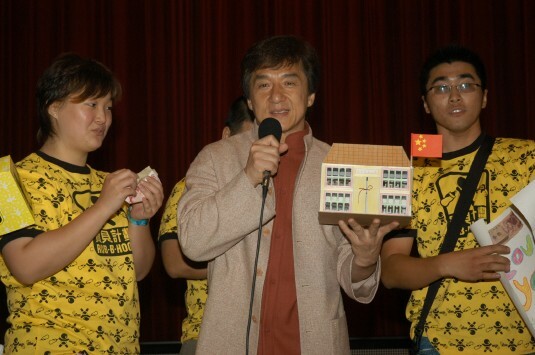 On September 21st when Jackie was in Shanghai for the premiere of Rob-B-Hood, he was extremely moved when a group of fans presented him with a paper and cardboard model of a Dragon's Heart School. The fans stuffed the school with 1,800 RMB (over US$230). This is a tremendous amount of money when you consider that average annual per capita disposable income of people in Mainland China was around US$1,300 last year! 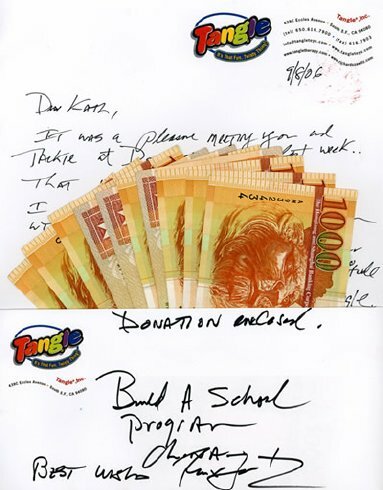 The fans also gave Jackie Build a School drawings with even more money attached. Jackie told the audience all about the program and said he was so happy with the response of fans all over the world. He asked them to continue to support the program. Jackie holds the cardboard school while the fan to his right prepares to put money inside! Fans have been sending in their donations so quickly that we can hardly keep up with the scanning and posting. Evenutally we will display the drawings on the website, but Jackie wanted to thank each and every one of you for your donation. 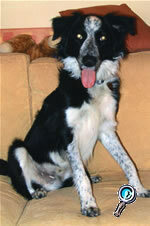 He also wants to thank those who donate through our website. In the past three weeks we have received US$115 from our website donation page*. Each donation is noted and we appreciate all of them. Jackie is also very excited about the fans who have written in to say that they are involving their schools or their children's schools in the project. He wants all of you to know how much he appreciates your generosity! *Please remember that if you donate at our online page, you must choose "Dragon's Heart Foundation" for the money to go to the Build a School program. To see new photos of Jackie, click here. Jackie's Fans Have Been Very Busy! 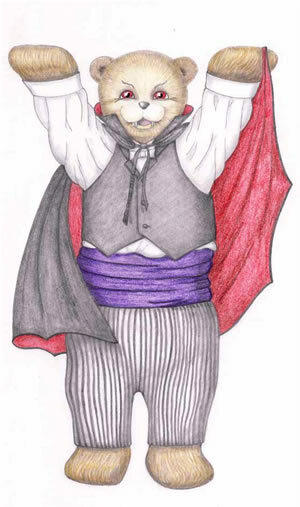 In the last week we have received nearly 40 new Buddy Bear designs and a whole bunch of new Halloween Costume designs from Jackie's very busy and creative fans. Thanks to everyone who has sent in a design. If you've sent in a design but don't see it posted, wait a while before emailing because it takes some time to get them all posted at our website. The Build a School for a Dollar Project has taken on a life of its own! So many people have sent in donations that we are having a hard time keeping up with getting them all scanned, counted, and posted. The total amount for donations keeps creeping higher and higher and we will post the updated number as soon as possible. Thanks to everyone who has gotten involved in this wonderful project. Thanks also to the people who have voluntarily brought this project to the administrators of their local schools to encourage them to get involved. We have at least two people who have gotten a positive response when they've brought the Build a School idea to their children's teachers or principals. Thank you so much! Jackie is very excited about this project and mentions it frequently at press conferences. So keep your donations coming! Remember, even a dollar can help. Well, it took a while but we have now posted the prizes for the Design a Jackie for Halloween Contest. These prizes were worth waiting for because they are very cool! Click here to see what you can win in the Halloween contest! Build a School Fun Gets Big Boost! Thanks to two very generous people who stopped by our offices this week, the Build a School fund has just taken a giant leap forward! 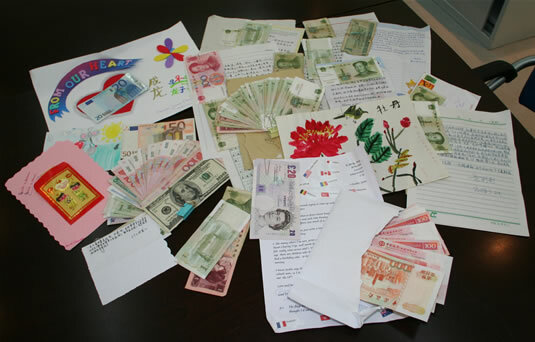 Then, the next day, a fan from the United States came by to drop off her donation of US$300! Thank you so much to Carla, a very generous lady! To read more about the Build a School Program, click here. Jackie Loves Your Halloween Designs! 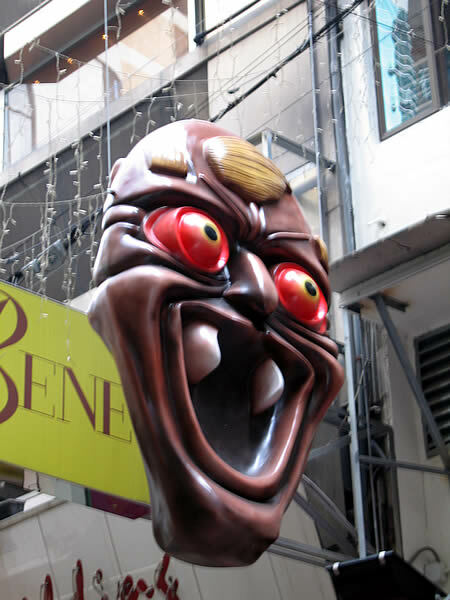 Yesterday Jackie had a look at the designs that you've sent in so far and he was laughing out loud when he saw them! He can't wait to see more, so please send yours in. To see the latest, click here! Check out the new story in our Sharing Corner. If you would like to contribute a story, just send it to our office or email it to the webmaster. Wow!! New Halloween Contest Designs!! There is no doubt that Jackie's fans are the most creative people in the world. If you want proof, just click on the Halloween Jackie below and see all the amazing new Jackies at our Decorate Jackie for Halloween Design Contest! Build a School Project Nears US$3,000 in Donations!! You might have noticed that our total donations more than doubled this week. 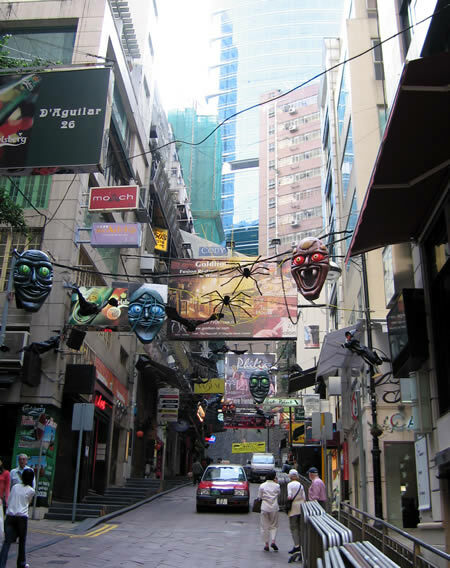 That is because when a very generous man named Richard Zawitz heard about the Build a School Project, he matched the amount in our "bank" with a donation of HK$10,000 (US$1,290). We met Richard at dinner one night last week (he's good friends with one of Jackie's old pals) and he was so excited about the project that he immediately offered to help. Several days later, the money was hand-delivered to our office. Richard is the inventor of that fun twisty thing called the Tangle. Thanks, Richard! 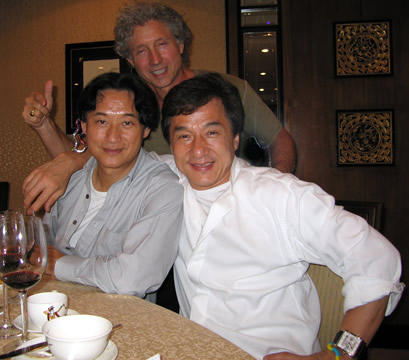 Richard (standing) with Jackie and their friend Dominic Lam. More Decorate Jackie for Halloween Designs Arrive! A big thank you to Dan from England for getting the Halloween Contest started! 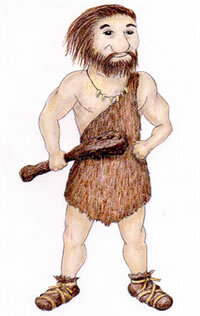 Dan is the first one to send in a costume design. Click below to see the rest of the entries in our Create a Halloween Costume for Jackie Conest 2006! Build a School Project Tops US $1,000 !! In addition to Gemma, many of Jackie's other friends have pledged thousands of dollars to help. As soon as we receive those pledges, we will add the money to our total. Since Jackie is matching every dollar that is donated, we only need to collect half of the US$75,000 cost to build a school. So keep your donations coming and please tell your friends (especially if they are teachers who need a project to do with their classes!). Please click here to see the latest donation drawings! Thank you to all of the generous fans who have donated through our website using a credit card. Although your donations are not posted on our website like the drawings are, we know who you are and we are very appreciative and thankful for what you've done. Fans have donated a total of over US$300 through our website! Thank you!! If you'd like to help, you can click here to make an online donation of any amount (make sure to choose Dragon's Heart Foundation from the drop down menu). Every little bit helps! 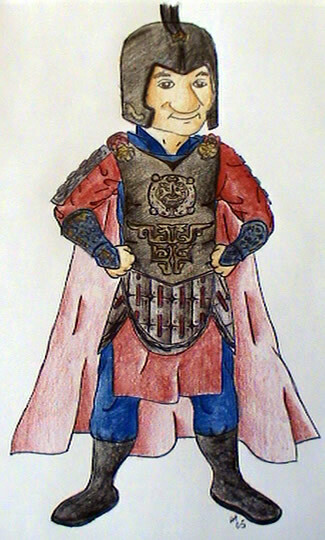 Read a terrific story written and produced by Constantin and his family! There are more photos of Jackie in the Build a School section of the Kids Corner. Have a look here! DOLLAR FOR DOLLAR UNTIL THE GOAL OF US$75,000 IS REACHED!! ...Jackie said that he would name the school after you; he's already begun thinking of names! That shows what kind of faith Jackie has in your ability to meet the goal! We will keep track of donations here on the Official website. Click here to see the latest donation drawings. Click here to see lots more photos of Jackie. 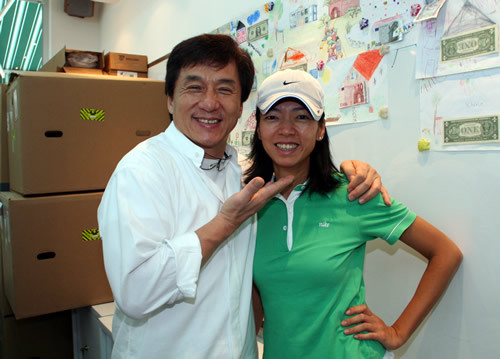 Click here to read about a very generous fan and about Jackie's reaction to what she did. Thank you to everyone who sent in a donation! Click here to see the new ones. New drawings in the Art Gallery! Wow! Pets named after Jackie...click here. And don't forget to check out the big news from yesterday (just look below). WOW!! 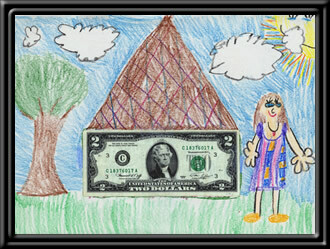 Jackie's Build a School for a Dollar Campaign is a Big Hit! Click on Autumn's donation drawing to see them all! Jackie wants to thank everyone for their generosity and he said that he knows this is just the beginning. So keep the donation drawings coming. You are helping in a big way! RIGHT CLICK your mouse on Jackie, choose SAVE TARGET AS and save the file to your computer. Then, go eat dinner, take a walk, or bathe the dog. This is a big file and will take time to download. When you return, just watch the video from your computer's hard drive! 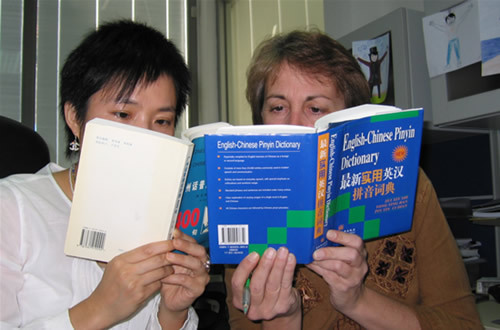 CLICK HERE to see the video in Mandarin Chinese. Here's Jackie posting all of your beautiful donations to the board so we could take photos. Click here to see photos of Jackie with the new donations. The Latest Jackie News is archived to save room on this web page. To read past news reports, just click on the month you're interested in viewing. Remember that some of the older links in these news archive may no longer be active.